Many people receiving structured settlement payments face pressing financial needs, which cause them to consider selling their annuity for a lump sum in cash. Sounds simple, but the process is actually complex, time consuming and fraught with pitfalls for unwary and uninformed consumers. If deceptive advertising by companies who profit from these transactions has lulled you into thinking you'll get all your money instantly, STOP! and consider these little known facts: Selling a structured settlement: 1. Requires a Court to approve the transaction; 2. Will take up to 90 or more days to complete the process; and 3. The final "net" amount received is far less than the "face value" of the annuity. Because a person who sells a structured settlement annuity will receive a deeply discounted amount of money, it is critical to be as informed as possible before making the decision to sell. Plus, as not all transactions are approved by a Court, there's no guarantee your sale will be approved as a court must first find that the sale is in your best interests. Mr. Ahtirski knows the Court system, and also knows how to help sellers of structured settlements seek to negotiate a higher purchase price from the various companies that buy structured settlements. Put our experience to work Since 1994, attorney Eugene Ahtirski has been an active participant in almost every area of the secondary market factoring industry pertaining to the sale of future payment streams and has personally participated in thousands of court approved transfers. Mr. Ahtirski experience extends to various other forms of payment streams as well besides structured settlement payment rights such as casino and lottery payouts, and entertainment industry residuals. Results 24 hours a day, 7 days a week, 365 days a year Contact an expert who can accurately evaluate your structured settlement You need not settle for small payments over a lengthy period of time. Get the maximum present value for your full recovery by calling the Law Offices of Eugene Ahtirski at 800.200.4384 or contacting the firm online. 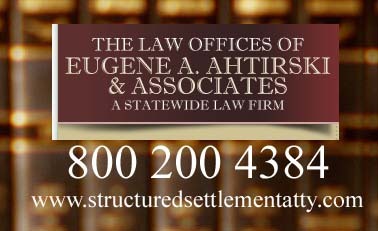 The Law Offices of Eugene Ahtirski 800.200.4384 Is one of the leading names in the transfers of Structured Settlements, and has personally seen and represented thousands of these cases through the legal system as a Structured Settlement Attorney. If you are considering buying, selling, or transferring a structured settlement, annuity payments, insurance payments, lottery payments, or other future payments and are seeking advice from industry-leading professionals, you've come to the right place. We are Nationally Recognized Independent Professional Experts Advisors in all ares of Structured Settlement Transfers, and Secondary Market Annuities. Eugene Ahtirski Law is a full service law firm focused to practice as a Structured Settlement Attorney, Representing clients Selling Structured Settlements, Transferring Structured Settlements, and Buying Structured Settlements. People decide to sell future payments to a structured settlement annuity buyer or buyer of future payments for many different reasons. Some plaintiffs decide to settle out of court with a structured settlement, always intending to sell their payments for a big, cash payment. Plaintiffs who always intend to sell their settlements differ from those who agree to a structured settlement to replace lost income and who later sell part of their settlement to meet sudden financial demands. When You Sell a Structured Settlement You Are Parting With a Source of Future Income You should take great care to ensure the buyer's offer sufficiently replaces the funds from your settlement. Take your time before making a sale. Compare the offers of several companies. Comparing multiple offers is the best way to determine whether you are receiving a good offer. After working with one of the first and largest structured settlement Factoring companies, helping set up procedures in accordance of passing legislation, we found the consumers needed protecting as well. Eugene Ahtiski has been cited, interviewed, and Nationally Recognized Expert in the the Structured Settlement Transfer or Secondary Market Annuity Market. With thousands of Structured Settlement Transfers under our belts over the last 20 years. Our Staff has more experience in the process than most people in the industry. The Law Offices of Eugene Ahtirski has been a driving force in the transfer of structured settlements with close to 20 years of experience. Having brought thousands of cases to court over the last 20 years has given us the hands on experience to under stand the ins and outs of the legal system in regards to the transfer of structured settlements, and secondary market annuities. Being recognized nationally as a Structured Settlement Expert, after so many years of building a reputation as an ethical attorney with the knowledge of how to navigate the courts.